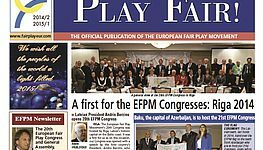 The Sammarinese Fair Play National Committee announces the winners of the "2nd World Fair Play Day"
The Sammarinese Fair Play National Committee announces the winners of the "2nd World Fair Play Day". The event will be held on 17 November at 16.00 at the Little Tony Auditorium Little Tony Auditorium of Serravalle RSM. 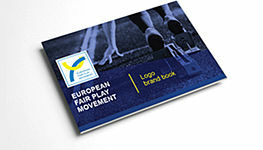 The "Fair Play Flame Awards" of the European Fair Play Movement (EFPM) will also be presented to Simone Salvi and Nicolò Francescotti in the presence of the EFPM Official Delegate Ruggero Alcanterini, member of honor of the European Fair Play Movement and President of the Italian National Fair Play Committee. The rich day will also be enriched by the Fair Play Youth Awards of San Marino RTV and "La Serenissima" the Giornale dei Sammarinesi, Media Partner of the event, conferred to two young Sammarinese Simone Salvi and Tommaso Benvenuti and whom the CNSFP wishes to address warmly thanks to the Director General San Marino RTV Carlo Romeo and the Director Massimo Boccucci for having shared, appreciated and supported the cultural cultural event put in place by the CNSFP. While the Fair Play Merit Diplomas will be delivered to: Asco 35 San Marino, San Marino Special Olympics, San Marino Gymnastics Sport Club. 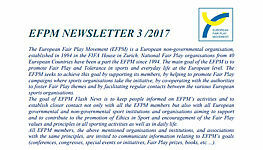 Soon the Fair Play Sammarinese National Committee will communicate the rich program of the waiting World Fair Play Day in which Sport, Culture, Education meet and to which anyone is invited to participate to share with the protagonists of the Sport the deserved and coveted Fair Play Awards .